This word was told me by Ms. Lee Jihea, who I already mentioned on this project "calligrarhy 6". She has an older brother, who is university student in South Korea and is trying hard to find a job now. She said to me that she wanted to encourage him by giving him a message through this project from New York. I was so impressed with their heartwarming relationship and accepted her request. 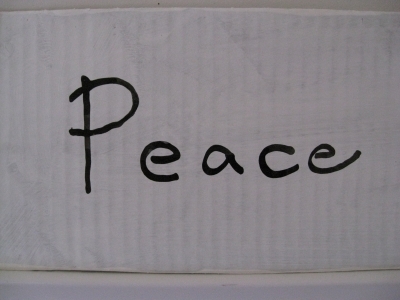 This word "Peace" derives from the meaning of his name. His name is pronounced Pyeong haw in Korean. They are Korean and in their 20's.